The downtown neighborhoods, city streets and government and business districts of this quickly-growing and rejuvenated city will be on display for runners and walkers this fall at the Indianapolis Monumental Marathon & Half Marathon, which makes its 11th annual running this year. Runners will follow an out-and-back loop course through the streets of what has come to be known as the “Crossroads of America,” thanks to its easy access from all sides as well as the fact that roughly half of the nation’s population lives within a day’s drive of the city. The race, aptly named as it takes runners and walkers on a tour past the city’s Indiana State Capitol, Monument Circle and other federal monuments, begins on Washington Street near the Indiana State Museum, and is mostly fast and flat with a number of small hills thrown in. The elevation changes are never significant, however, as the race’s lowest point occurs just below 700 feet and its highest just above 730 feet above sea level, taking participants all the way through to the finish line just off North West Street, not far from the starting line. 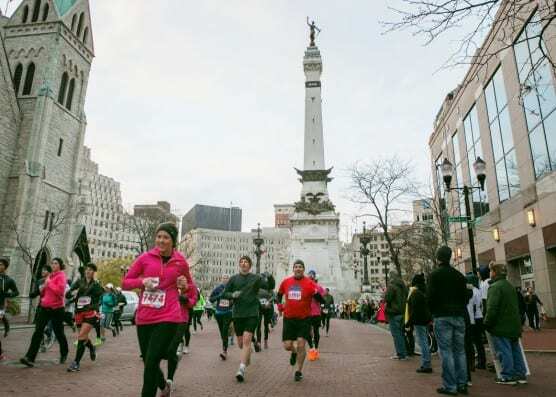 The course follows what is largely a north-south route through the city, passing by Monument Circle and University and Veterans Memorial Parks on the way to North Meridian Street, which participants will follow for the next several miles. The turn back toward the finish occurs at East 37th Street, where runners begin making their way back along North Talbot and North Pennsylvania Streets. Along the way, participants will also see many of Indianapolis’s oldest and most historic neighborhoods, including Fall Creek Place, Old Northside, Butler-Tarkington and Broad Ripple. Open to runners, walkers and wheelchair competitors, the course will close after 6 1/2 hours, which means that half-marathon participants will be required to keep a roughly 15-minute-per-mile pace for the first half of the race. Located in almost the exact geographic center of the state and approximately 150 miles south of Lake Michigan, Indianapolis enjoys cooling weather conditions and occasional rain and storms in November, which has brought record temperatures here as low as 0°F (in 1958) and as high as 82°F (in 1986). On race day (Nov. 9), the average low is 38°F and the average high is 56°F. See the course map for the Indianapolis Monumental Half Marathon here. To reserve your spot in the the 2019 running of the Indianapolis Monumental Marathon, Half Marathon or 5K race, register online at GetMeRegistered.com here. Ever run in the Indianapolis Monumental Half Marathon? Share your impressions here, or post your review in the Comments below. Do you have a hotel list offering a group rate for the race? We were hoping to get your approval in using the photo “Courtesy Indianapolis Monumental Marathon” for a bicentennial story I have written. We would make sure to give you the appropriate credit for it.